Delicious golden honey that's heavenly on its own or on a slice of fresh bread. Part of the exquisite taste of this fine honey is thanks to the producer's insistence on ensuring its hives are in areas that are far removed from traffic and any other potential sources of pollution. The honey is sourced in Piedmont, in the Gran Paradiso National Park, in Val Sangone and in Val di Susa. A precious source of natural energy to keep in the cupboard and an ideal alternative sweetener. Ingredients 100% honey produced in Italy. Allergens: may contain traces of nuts. For more information on product labels, please contact our Customer Service department. The information on the labels of the products may vary for reasons beyond our control, therefore, there may be discrepancies between the information on the site and that on the products delivered. Please always check the information on the product before consumption or use. Eataly strives to bring you top quality honeys, which is why we've chosen honey produced by Apicoltura La Margherita, a small honey producer named after proprietor Margherita Fogliati, who has clearly inherited her father's passion for beekeeping. The honey is sourced exclusively from the firm's own hives, which are located in the most unspoiled areas in the province of Turin, in order to ensure consistently exceptional quality. 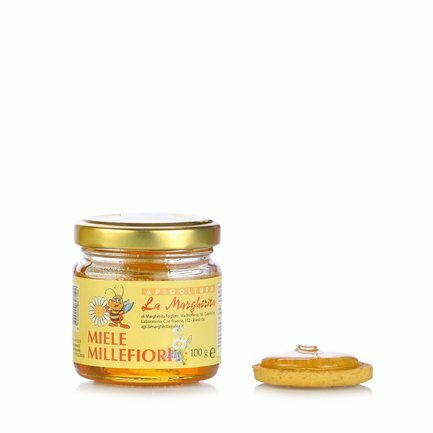 Since 2006 the company has been a member of Associazione Miele delle Vallate Alpine della Provincia di Torino, a provincial beekeepers' association that oversees production in compliance with strict rules. The wholesomeness of La Margherita products has been recognised in the context of several national tasting competitions and has been awarded several quality certifications.